Protect and organize your microphones. 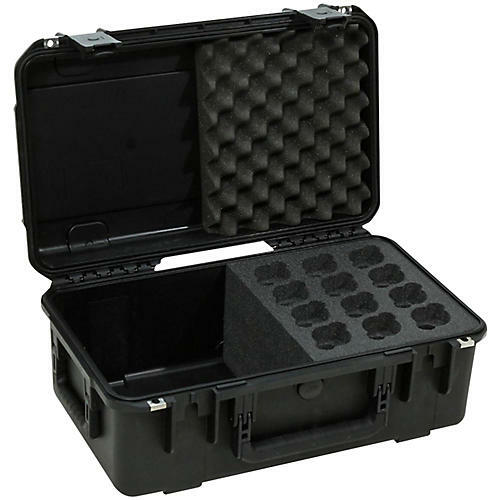 The 3I-2011-MC12 microphone case holds twelve microphones stored vertically and is part of the iSeries waterproof case line. The microphone holes are designed to secure most popular types of handheld microphones, finger cutouts that provide instant access, and a generous storage compartment for cables and microphone clips. The interior is made of high quality PE foam designed to last. The 3I-2011-MC12 microphone case measures 20" x 11" x 8" deep and is covered by SKB's Unconditional Lifetime Guaranty. 3i Series injection molded waterproof cases are constructed of ultra high-strength polypropylene copolymer resin and feature a gasketed, waterproof and airtight, submersible design (IP67) that is resistant to corrosion and impact damage. Its continuous molded-in hinge, patented "trigger release" latch system, comfortable, snap-down rubber over-molded cushion grip handle, secure stacking, and automatic ambient pressure equalization valve (MIL-STD-648C) all contribute to its military grade design. Order now and your mics will retain their good condition and be far less likely to get left at a performance.